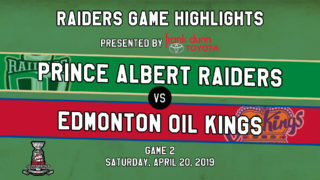 Prince Albert, SK – The Prince Albert Raiders (41-7-0-2) returned to the Art Hauser Centre on Friday night, but fell 6-3 to the Edmonton Oil Kings (28-15-4-4) on Friday night in a battle of Eastern Conference division leaders. Cole Fonstad led the way for the Raiders with a pair of goals. Noah Gregor also had two assists. 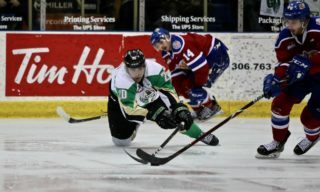 The Montreal Canadiens prospect opened the scoring for the Raiders late in the third. Fonstad found Gregor on a cross-ice pass. The San Jose Sharks prospect’s shot was blocked, but the puck found the stick of Fonstad. The Estevan product buried it into the empty side of the net to make it 1-0. Midway through the second, the Oil Kings took the lead with a pair of goals. Jalen Luypen tied the game after he was sprung on a partial breakaway by Zach Russell and snapped a shot past Ian Scott at the 7:59 mark. Then, after the Raiders were pressing on a power play, the puck bounced out of the zone and found the stick of Conner McDonald leaving the penalty box. McDonald skated in and beat Scott to put Edmonton up 2-1. Late in the second, the Raiders tied the game on Fonstad’s second of the game. Zack Hayes’ point shot was stopped but Fonstad was able to tuck home the rebound from the top of the crease for his 20th goal of the season. Less than two minutes later, Brayden Pachal gave the Raiders the lead again. Sean Montgomery found Brett Leason with a pass who appeared ready to shoot. Instead, he found Pachal cutting through the slot and the Raiders captain snapped a shot through Todd Scott’s five-hole to make it 3-2. Before the end of the second, the Oil Kings took the lead back. Trey Fix-Wolansky scored back-to-back goals 56 seconds apart to put Edmonton up 4-3 after two periods. In the third, Edmonton extended their lead at the 5:09 mark. 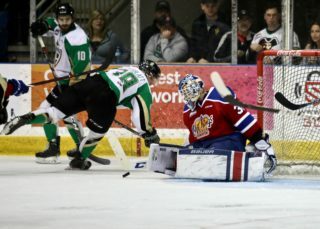 McDonald streaked down the right wing and picked the corner on Scott to give the Oil Kings a 5-3 advantage. Vince Loschiavo iced the game with an empty-net goal with 3:24 to play. 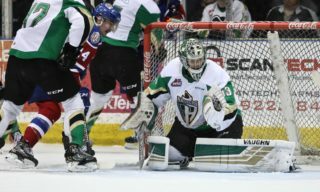 Ian Scott made 22 saves in a losing effort for the Raiders before being pulled in favour of Boston Bilous. The former Oil King stopped all four shots fired his way by his former team. AT the other end, Todd Scott stopped 39 shots in the win for Edmonton. 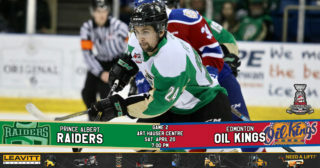 The Raiders are back at home on Saturday night when the Moose Jaw Warriors (28-11-6-2) visit the Art Hauser Centre. Saturday night is also WHL Suits Up with Don Cherry to Promote Organ Donation Night Presented By RE/MAX. The Raiders will be wearing Don Cherry-themed jerseys on the evening that are currently up for auction at 32auctions.com. Puck drop for Saturday’s game is 7 p.m. Tickets are available at raiderhockey.com and the box office, which opens at 10 a.m.